Skincare Sunday - Zoella Beauty "Soak Opera" + a giveaway! Happy Sunday everyone one! Do you love beauty videos as much as I do?! I'm sure by now you have heard of Zoella! Zoe has been doing beauty and fashion videos since 2009 and has recently expanded to start a line of bath products! Zoella Beauty "Soak Opera" - Bath Soak and Shower Cream ~ $11.99. A delicately fragranced 'beauty in a bottle' bath soak to calm the senses with soothing floral notes. Enriched with Vitamin E, Aloe and Shea Butter extracts to soften and condition the skin. All the Zoella bath products come in a specially created fragrance that includes notes of grapefruit, jasmine and musk. The scent is really great - I love it! It is light and fresh with the grapefruit scent, but deep and a little spicy as well! This is a bubble bath and shower cream product - I will leave it by my bathtub so I can use it for both! This gets super bubbly in the bath and lathers really well as a shower cream as well. The scent lasts and smells great! I really like this! The Zoella beauty Core products include lotion, body mist, bath fizzers, shower gels, beauty bags and more! The products are available in Canada through Farley Co. and you can look for them at your local London Drugs, Pharmasave, IDA, Lawtons Drugs, Familiprix, Guardian, Brunet, and Uniprix. There is a fall collection coming out soon that includes bath latte, bath sugar, body fondant, and more! 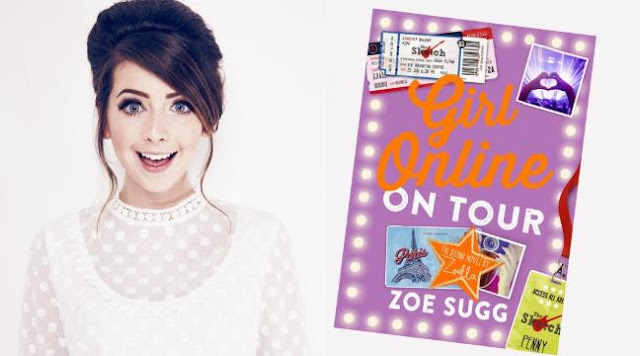 Thanks to Farleyco, I have a Zoella Beauty Product of your choice along with a copy of Zoella's new book "Girl Online: On Tour" to giveaway! "In this sequel to the New York Times bestseller, Girl Online, Penny joins her rock-star boyfriend on the road in Europe. Zoella Beauty Blissful Mistful Fragranced Body Mist catches my eye!! Mine too - the scent would be great if it is anything like the soak opera! The Zoella wonder hand cream looks lovely. Zoella Beauty Bath Soak Opera Bath Soak and Shower Cream sounds wonderful! I love versatility in products! Ahh, yes it's a great product! The scent sounds like it would be great. Id like to try the fizz bar! The fizz bar is on my list to try too! The diffuser caught my eye! Love it! yes, this is a great scent for a diffuser! I like the look of the Zoella Beauty Fizz Bar Fragranced Bath Fizzer. I would love to try the fizz bar too! I would love the Zoella Beauty Fizz Bar Fragranced Bath Fizzer. The fizz bar looks great! I agree everything looks great! I love the Fizz Bar Bath Fizzer! I think the fizz bar looks great! I love the makeup bags too! The bath fizzer looks awesome! I'm sure it is great! The Zoella Hey Roomie Reed Diffuser looks great!